Searching for & finding gold in the Silver Crown district in Wyoming in 2012. 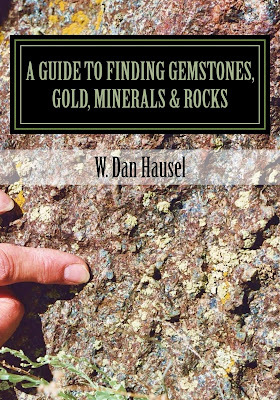 As a gold or gemstone hunter or prospector, you must understand geology and chemistry of rocks while keeping an eye open for a variety of gemstones, precious metals, base metals and diamonds. 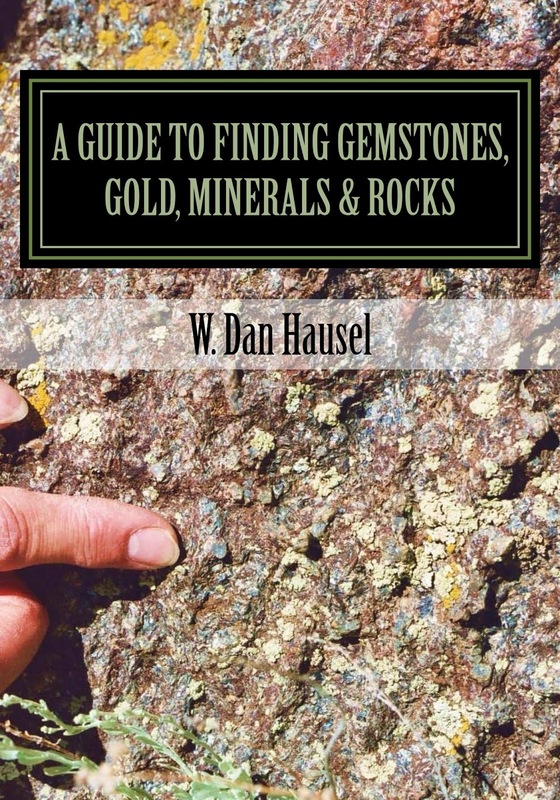 Sorry, it takes years to understand rocks and their chemistry, but I've tried to provide prospectors and rock hounds with information they can understand in my webpages, blogs, blogspots, Google+, books and other publications. Heck, even I have a hard time understanding many geology professors when they add unnecessary jargon to confuse issues. Before they give any one a PhD, they should ask the candidate to provide examples of their communication skills with the general public. All of those valuable gemstones and gold found in rocks are related to chemistry of the rocks, invading fluids, and geological history. For example, if you look for gemstones with considerable aluminum - such as ruby and sapphire - look for host rocks that have lots of aluminum (mica-rich schists, etc) to contribute; or evidence that aluminum-rich fluids migrated through fractures. Then look at the past geological history - how deep were the rocks buried in the past (if at all), when did they uplift, how much erosion occurred, etc. I know this type of information is difficult to come across, but any clues will help. Years ago, I worked for the Wyoming Geological Survey at the University of Wyoming in Laramie. While working on a research project with the Department of Engineering in 1980, I began to search for disseminated gold and base metal deposits for the department. The University of Wyoming engineers were interested in conducting metallurgical and chemical studies for metal extraction in disseminated deposits. So, I examined the areas in Wyoming that potentially could have these types of deposits based on geology. I knew I needed some good source rocks for the gold and also some volcanic rocks that were very hot in the geological past and this took me to only a couple of places - Mineral Hill in the Black Hills, Bear Lodge Mountains in the Black Hills, the Silver Crown district in the Laramie Mountains, the Rattlesnake Hills in the Granite Mountains, the Absaroka Mountains bordering the eastern flank of Yellowstone, and Yellowstone. Unfortunately, Yellowstone and the Absaroka Mountains were off limits since the Feds had withdrawn them from mineral exploration even though some of the rocks in this area are likely rich in gold. Oh well. 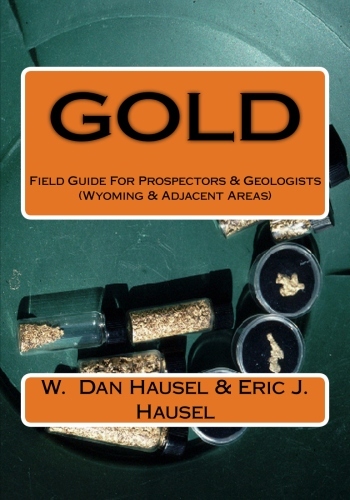 Two places I thought had very good potential for this project included the Rattlesnake Hills in central Wyoming, where I discovered an previously unknown gold district and investigated a large jasper deposit with some actual leaf imprints, and the other was the Copper King mine in the Silver Crown district where a sizable gold-copper resource occurred in a deeply eroded porphyry copper deposit of Proterozoic age (about 1.4 billion years old) that had been uplifted and exposed at the surface just a few miles outside the town of Cheyenne. cases he gives you GPS coordinates to find these sites on Google Earth. GPS conversion box at the top of the Gold Prospecting blogspot. Yes, that's me (above photo), working for Saratoga Gold and Strathmore Resources as an independent consultant looking for additional gold resources at their 2 million ounce gold-equivalent gold-copper deposit known as the Copper King in the Silver Crown district near Hecla, Wyoming. And I believe I found a continuation of their gold deposit by 'reading' the rocks: it was down-dropped along a fault in the geological past and now lies under shallow, alluvium-covered basin to the east of the primary deposit. So, within reach of Cheyenne, there is a minimum $2.6 billion ($1,300/ounce gold price) gold-copper deposit with much of it sitting at the surface and an untold amount of gold remaining to be drilled. AND, for those of you who like to pan, streams that drain this deposit will likely have some gold, particularly near the deposit. After millions of years of erosion, some of that gold should have been carried downstream. So, check the area, check the topographical maps, check Google Earth (41°8'42"N; 105°11'11"W) and start looking for gold and diamonds! But please don't trespass on private property. It is interesting that the Copper King is deeply eroded based on its geological history - and so are the kimberlite pipes in the Colorado-Wyoming State Line district to the west along Highway 287 as well as the cryptovolcanic structures that lie in between. So, you might take a gold pan, find some public access, and then pan for gold and diamonds. Both will likely be found in a drainage or two in the area. And yes - I know most are dry drainages, so you may have to transport some dirt to water, or vise versa, or learn how to dry pan. When I taught prospecting short courses through the School of Extended Studies at the University of Wyoming, I periodically taught this technique. It works great in Wyoming because of all of the wind, but it also leaves you very dirty. So why hasn't anyone done this before? Good Question. Not far from from the Copper King, I identified more than 50 cryptovolcanic structures that likely include one or more kimberlite pipes for an Australian diamond company (DiamonEx). Many kimberlites are known as sources of gem and industrial deposits. To see some of these structures, just use Google Earth and do a search for Twin Mountains Lakes, Laramie County, Wyoming and you will see an area on the areal photography that shows a major regional fold in the old Precambrian rocks with several, distinctly rounded to elongated lakes. Google Earth also provides different ages of photography, so take a look at the 1999 and 2002 vintage photos and you will see the lakes have what appears to be a white salt in the soil. If this is carbonate - it may have been derived from kimberlite as the old, folded Precambrian rocks are a poor source for calcium carbonate. You can test soils like these with 10% hydrochloric acid and the acid will free carbon dioxide and the soil will fizz like soda pop! But beware, our incredibly non-intelligent government expects to outlaw carbon dioxide. Seems that politicians are looking to fill their pockets with money over carbon credits. So, how dangerous is this carbon dioxide - you tell me the next time you drink a soda, exhale, or walk outside among the trees and grass. How is it that we keep electing dumber and corrupter politicians? Ha! Its because the only people who run for office are sociopaths and pathological liars. Back to the rocks. I found similar depressions (structurally controlled all over this region in Colorado and Wyoming - actually more than 300! crystals in the State Line pegmatites are pink to brown orthoclase feldspar. Just west of these crypto volcanic structures, I found a few diamond deposits from 1977 through 1980, in the State Line district where several other diamond deposits had already been found associated with a rare rock known as kimberlite. Most of these were found by David Eggler, Mac McCallum and Chuck Mabarak. So, what is a crypto volcanic structure? It is a structurally controlled depression that looks similar to an impact feature. And, who knows, some could be impact features. Years ago, I looked at one such anomaly in Kansas known as the Winkler Crater. This feature (39°29'25"N; 96°49'13"W) was initially identified as an impact crater until Doug Brookins spent some time on the ground and discovered the crater was filled with kimberlite instead - so it was a kimberlite pipe (volcano). Years later, Cominco American Mining Company tested the pipe and reported finding one micro-diamond in the kimberlite. And you can still see this anomaly on Google Earth. It is perfectly round, has a deeper green color due to the vegetation growing over the kimberlite, and you can still see the scars of the trenches dug in the kimberlite by Cominco American many years ago. Smaller microcline feldspar crystal from Copper Mountain. For those who might be interested; there are some pegmatites in the area between the Copper King and Highway 287. Pegmatites are dike-like, very coarse-grained granitic rocks. And most of those found in this region have considerable milky white quartz that prospectors call 'bull quartz'. Not sure why they call it bull quartz. 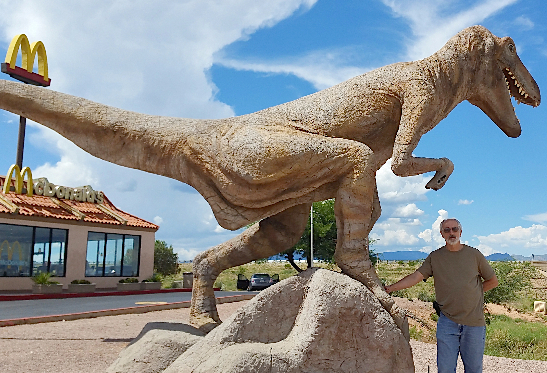 Anyway, some of these can be seen along Highway 287 south of Laramie (41°1'57.73"N; 105°26'3.95"W) and a few were mined during world war II for their coarse-grained feldspar crystals. I was told that the feldspar was used to manufacture false teeth. Look for some old mine cuts and also on Google Earth, you can spot these by their white quartz! So, look for the white quartz and also look for any piles of blue ground that might be kimberlite. 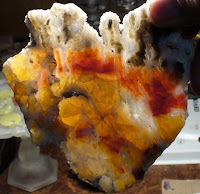 Anyway, in some of these pegmatites, you will also find some coarse-grained mica books, rare yellow-green, translucent to frosted beryl, and an occasional garnet - I found one crystalline garnet in the pegmatite off of Highway 287 that was 6 inches across - but the color and transparency were ugly! But the quartz is interesting. Periodically, one can find small, transparent, hexagonal quartz prisms in rock fractures, but most of the quartz is the bull quartz. The bull quartz in these pegmatites express piezoelectric characteristics very well. Of course, someone will think you are totally crazy for doing this - but what the heck. Most of us rock hounds are a bit nuts. Take a large piece of the bull quartz in a dark closet (large so you don't miss and smash your toes) and hit it with a hammer. You will be able to see a very nice spark generated within the quartz. Pretty neat! But again, whoever gets curious and opens your closet door is probably going to call for a straight jacket. A few of the minerals collected from Wyoming and cabbed. right, smoky quartz from Big Creek, WY. Quartz, chalcedony, agate and jasper are all the same material. They are all formed of silica (SiO2) and each is only different from the others because of crystallinity and/or color. For example, quartz is the most common constituent of the earth’s crust and when found in veins, it can be coarse crystalline with distinct crystals or massive with no distinct crystals - most often it is massive. When we speak of massive we mean that we cannot distinguish any distinct crystal form with the naked eye - and this is typical of rock quartz, jasper and agate. When found in hand specimen, this could be termed simply massive quartz, quartz, rock crystal or chalcedony. If the quartz is found in crystalline form, something that is attractive to mineral collectors, rock hounds, and new-age crystal healers, the quartz often occurs as hexagonal (6-sided) prisms that are almost always capped by a hexagonal pyramid. Less commonly, quartz is found as doubly terminated crystals. This means the quartz crystal has distinct hexagonal prisms at both ends of the crystal. By the way, I met a person years ago who had a round tower in their house filled with quartz crystals for healing. Scientifically, there is no way that quartz can heal a person unless it is psychosomatic – it is like putting your trust in a politician not to spend your money. Quartz is typically found as (1) rock crystal, (2) amethyst, (3) citrine, (4) smoky, (5) rose, (6) chatoyant quartz, or (7) crystalline quartz. quartz referred to as rock crystal. Quartz has a relative hardness of 7.0 on the Mohs Scale. This is just a little harder than your car’s windshield – this is why your car's windshield gets pitted if you live in areas with blowing dust and sand like Arizona. Quartz is found in a multitude of colors that include colorless, white, red, orange, yellow, gray, brown, black, lavender, violet, purple, pink, blue or green. Essentially every color is seen in quartz. In its chemically pure form, quartz is usually colorless or white. As with other gemstones, small amounts of chemical impurities produce a variety of colors. Quartz with impurities is quite common, and the range of possible colors spans the spectrum. In its various valence states, iron produces many colors in quartz, the most important being the purple to red-violet of amethyst and the lemon-yellow of citrine. Iron is also responsible for reds, yellows and browns typical of many agates. Iron gives carnelian and jasper their brownish-reds and oranges. Iron or manganese produces browns and blacks in dendritic agates. Traces of titanium cause the characteristic pink of rose quartz and nickel gives chrysoprase its apple-green color (Schumann 1997). Other chemical colorants are possible. Mineral inclusions in coarsely crystalline quartz and in cryptocrystalline varieties may also impart colors as well as optical effects such as chatoyancy. Quartz has a specific gravity of only 2.65 (more than twice as heavy as an equal volume of water). Generally none. In other words, you are not going to be able to break quartz along distinct planes like you would diamond. If you do strike quartz with a chisel and hammer to try to cleave, it will break forming conchoidal fracture (just like broken glass). Quartz from the Big Creek district, Wyoming (photo by Wayne M.
Cleavage reminds me of attractive women, but it also brings back memories of a family from Cheyenne who visited my office at the University of Wyoming thinking they had found the largest diamond on earth: the size of a football. They had been told by a gemologist in Cheyenne that it was a diamond, but needed to have it verified by someone else (now that was a very good suggestion). When they brought it into my office, I knew immediately it was rock crystal, but wanted to let them down slowly. So I toyed with them a little and then got out a diamond chip and cut the quartz with little effort. They were visibly disturbed that I would dare scratch the diamond that would pay for their mansions and allow their off-spring to live a life of luxury. After I pointed out that if it was diamond, I would have had a very difficult time cutting the stone, they relaxed and the sweat stopper pouring from their brows. BUT – they were not done. On our staff, we had a super person and geologist, but was somewhat of a klutz. Ray unfortunately ran into one of the most disgusting politicians in Wyoming who drove him to an early grave a few years later. Anyway, Ray was a very good field geologist, but he was not so good at mineralogy. A few weeks later, this family came back to the university and asked to see Ray and avoided me. Ray told me what was going on and I said he should go ahead and give these people a third opinion. But what these people didn’t know was that Ray had no experience with diamonds. During this meeting, Ray told the family he wanted to look at the Crystal a little closer. As he was carrying the stone to this lab, he dropped it. I wish I could have seen everyone’s expressions – it would have been priceless. Here was a 'diamond' much larger than the 3,106 carat Cullinan (the largest ever found), and it was dropped on the floor shattering into dozens of pieces. Ray’s response simply was, “well, it has conchoidal fracture, so it’s not a diamond”. Ray was partially right. been drinking too much coffee and stopped in a low spot to relieve our selves. agate. Next I found a couple of more, and then Wayne started finding some. Diamonds also have conchoidal fracture, but if it were a diamond and was dropped on the floor, it would have produced pieces with conchoidal fracture as well as pieces with flat, smooth, cleavage planes. But it didn’t matter. This was just another rock crystal – one of many that I examined over the years brought in by prospectors thinking they had gold or diamonds. Trigonal, hexagonal-rhombohedral. The common habit of quartz is anhedral (formless) masses and well-formed hexagonal prisms capped by one or two hexagonal pyramids or terminated by rhombohedra. Quartz crystallizes in the trigonal system (Berry and Mason, 1968; Hausel 1986, 2005, 2009, 2011; Kievlenko, 2003;). Coarsely crystalline quartz most often is found as anhedral grains and masses in various rock types. Large crystals usually form singly terminated hexagonal prisms that are often striated perpendicular to the c-axis (the c-axis is an optic axis that is parallel to the hexagonal prism) and are capped by a pyramid or rhombohedra. Such prisms typically range from microscopic to crystals weighing several hundred pounds. Periodically, doubly terminated prisms are found that are bipyramidal, but these are less common (Mason and Berry, 1968). Amethyst typically is dominated by forms with rhombohedral faces, whereas prism faces are absent, or at best, poorly developed. This habit is typical of crystals that have grown simultaneously on the walls of open cavities (Lowell and Koivula, 2004). Twinned quartz - note smaller crystal growing from larger. Quartz crystals are sometimes twinned with two different crystals growing together. Crystals usually vary from microscopic to specimens weighing several hundred pounds. On the extreme end, rock crystals have been found that weigh many tonnes (Schuman 1997). Pyramidal amethyst crystals up to 10 inches in diameter are reported from the vicinity of Thunder Bay, Ontario, although facetable gem material is usually only found within a small portion of such large crystals (Kievlenko 2003). Quartz is not fluorescent or luminescent (Hurlbut and Switzer 1979). Quartz (SiO2) is the most common rock-forming mineral in the earth’s crust and occurs in both coarsely-crystalline and microcrystalline forms. In pure form, it is composed of 46.7% silicon and 53.3% oxygen (Bauer 1968; Hurlbut and Klein 1977). Quartz is usually very pure SiO2 (Mason and Berry 1968; Hurlbut and Klein 1977). Quartz is infusible, and generally considered insoluble except in hydrofluoric acid (Bauer 1968; Hurlbut and Klein 1977). However, Deer, Howie, and Zussman (1971) note that the presence of either NaOH or NaCl in water accelerates both solution and crystallization of quartz by several orders of magnitude over that of pure water, which has ramifications relating to its geological occurrence. Quartz, being a common constituent of many rock types, is found in association with a wide variety of minerals. These include feldspar, muscovite, biotite, chlorite, tourmaline, beryl, hematite, iolite, barite, fluorite, nephrite jade, gold, sulfides and others too numerous to mention (Ford 1949; Bauer 1968; Keller 1990; Hausel and Sutherland 2000; Garland 2004). Many of these associated minerals often occur as inclusions within quartz. The diversity of the inclusions is a striking feature of quartz (Gübelin and Erni 2000). The introduction of silica-rich fluids into the presence of other minerals may be responsible for some inclusions, or the foreign inclusions may crystallize somewhat simultaneously with the quartz. Many of the better-known inclusions give rise to type names that are often listed as subspecies of gem quartz. Reddish-brown hematite flakes, or more commonly flakes of green fuchsite mica produce the glittery metallic appearance (aventurescence) and colors characteristic of the coarsely crystalline quartz variety known as aventurine (Schumann 1997). Rutilated quartz (quartz containing elongated mineral inclusions of rutile needles) most commonly exhibits yellowish-brown to golden-yellow colors, but also has produced coppery-red and silver-gray colors. Although rutile in quartz is relatively common, rutile in highly transparent quartz is rare. The abundance and parallel alignment of fine acicular rutile inclusions sufficient to produce chatoyancy in transparent quartz is rare (Koivula and Tannous 2004a). Gold has always been associated with quartz to the degree that early prospectors almost always looked for quartz in their search for the precious metal. Gold in quartz, most commonly in milky quartz, is cut and polished in a variety of shapes and sizes, primarily for use as jewelry. Striking specimens of gold-in-quartz have been produced from the Badger mine, Mariposa County, California, from the Sixteen-to-One mine in Sierra County, California, and from Australia (Laurs 2005c). Less commonly found within quartz include covellite, which produces an electric pink schiller in both smoky and colorless quartz (Quinn and McClure 2005), and pezzottaite (a Cs-, Li-rich member of the beryl group) that shows as a pink-zoned inclusion in colorless quartz (Koivula and Tannous 2005). Koivula, Tannous, and DeGhionno (2004) reported colorless quartz appears blue due to the copper content of abundant ajoite fibers, strawberry-red due to numerous transparent to translucent hematite inclusions, and green due to nickel content of included népuoite. Lead-gray metallic molybdenite inclusions have been found within large rock crystals recovered from the Confianza mine, Chile (Koivula and Tannous 2004d). Well-formed graphite cylinders and botryoidal masses have been found in rock crystal in Brazil (Hyrsl 2004b). Gas-fluid inclusions are common in quartz (Bauer 1968). Most are microscopic, but large visible ones also occur. Analysis of gas-fluid inclusions provides a wealth of information about the pressure, temperature, and chemical environment under which quartz crystallized. Such inclusions are always present in amethyst with the greatest abundance near the base of the crystal. These are primarily formed of gaseous and liquid carbonic acids (Kievlenko 2003). Carbon dioxide, water, and common salt are also found as inclusions (Bauer 1968), as are natural petroleum fluids, gases, and solids (Koivula and Tannous 2004b). Ginguro bands in silver-gold-bearing quartz from Arizona. Quartz crystals hosting both fluid and solid natural petroleum inclusions were reported by Koivula and Tannous (2004b) in Baluchistan, Pakistan. Yellow to brownish-yellow and clear fluid inclusions generally consist of natural petroleum, methane gas, and water. A yellow to orange or blue luminescence under long-wave ultra-violet light is characteristic of fluid petroleum inclusions. The darker bituminous, brown to black amorphous solid petroleum-derived materials are referred to as asphaltite. Doubly-terminate quartz crystals from Herkimer County, New York have been known to host amorphous asphaltite hydrocarbons as inclusions. These originate within silicified dolomites, and appear to have developed during digenesis of the host rock. Hydrocarbon inclusions are also abundant in Sichuan Province, China, but the Herkimer rock crystals are the best known (Hyrsl 2004). Rock crystal is essentially colorless quartz. Because of its low refractive index (the amount of light that is broken up to produce fire or a rainbow of colors) and glassy appearance it is seldom used as a gemstone. It exhibits characteristics similar to those of synthetic glass – thus it has few properties that would make it attractive for adornment. Even so, colorless raw quartz crystals are periodically used in earrings and necklaces due to the characteristic hexagonal prisms that are visually interesting. Beautifully crystallized quartz crystal prisms are attractive for museums and collectors. The recent nonscientific practice of crystal therapy has resulted in increased interests in quartz crystals along with increased prices. Amethyst. Amethyst is colored quartz that ranges from mauve to deep violet. The coloring agent for amethyst is small amounts of Fe3+ that is distributed in the crystal structure in layers typically parallel to the rhombohedral faces. Thus in many cut stones clear bands of quartz may be seen alternating with colored bands (Hurlbut and Switzer 1979). Amethyst has been one of the more popular gemstones throughout history and is even mentioned in the Bible as one of 12 sacred stones. It is generally considered the most valuable of all the quartz gemstones. Gems of similar color were once included together in a single group centuries ago, such as amethyst and sapphire. This is the origin of the term oriental amethyst that has been applied to similar colored sapphire. The color in amethyst can be modified through heat treatment. At temperatures of 250 to 350oC, the stone will become colorless; however, the color is restored by radioactive irradiation. At higher temperatures (450 to 500oC) the color is irreversibly damaged and the mineral may take on a reddish-brown to yellow-citrine color. The violet color seen in amethyst will form following radioactive bombardment (ionization) causing trace iron in the crystal to lose an electron and change from trivalent to the tetravalent state. Higher-temperature thermal heating will destroy both Fe3+ and Fe2+ centers in the quartz yielding a greenish to yellowish color in the crystal (Kievlenko 2003). In nature, amethyst is thought to have a hydrothermal genesis. Citrine is a pale- to dark-yellow, brownish-yellow, or honey-yellow quartz with a russet tint named after its resemblance to citrus lemons. It has been mistaken for topaz particularly in the ancient past and has erroneously been given additional names such as ‘topaz quartz’. Even so, citrine can be distinguished in both the faceted and natural form from topaz by index of refraction and specific gravity. In hand specimen, the crystal habit and cleavage is used to distinguish one from the other. Cipriani and Borelli (1986) report that the specific gravity for citrine (and feldspar gems) are the lowest for yellow, transparent gemstones, whereas topaz is noticeably higher. The luster is slightly inferior to topaz and topaz may show signs of incipient cleavage that would be non-existent in the citrine. The coloring agent for citrine is iron. Citrine can be produced by heat treatment of amethyst at high temperatures. Almost all citrines derived in this manner will have reddish tint that tends to contrast with the predominant pale-yellow in most natural citrines (Schumann 1997). According to Hurlbut and Switzer (1979), heat treated citrine will exhibit color banding typical in amethyst and lack slight pleochroism seen in natural citrine. In contrast, Cipriani and Borelli (1986) report that natural citrine exhibits patches and color bands similar to amethyst, although the zoning in citrine is less obvious. Citrine exhibits a nice vitreous luster and is generally free of mineral inclusions. Smoky quartz varies from black to brown to smoky yellow and grades into citrine. The dark color of smoky quartz is thought to be the result of radioactive damage during exposure to radiation. Upon heating, smoky quartz will turn colorless, and will return smoky upon exposure to radiation. Rutile needles are common inclusions in smoky quartz (Schumann 1997). The best-known locality is that of the Swiss Alps, where veins have yielded many tons of beautiful crystals. Other notable localities are Russia, Brazil, Madagascar, and Scotland. In the US, smoky quartz has been reported in the Pikes Peak region of Colorado, and at various localities in Maine and New Hampshire. Rose quartz often occurs as coarse-crystalline anhedral quartz that varies from pale pink to deep rose-red, which often fadesupon exposure to sunlight. Rose quartz is seldom transparent and instead is turbid. Its color is thought to be due to the trace titanium. In some rose quartz, microscopic needles of rutile are found that are oriented in three directions at 120o from one another and at right angles to the c-axis. When manufactured into a cabochon with proper orientation, the mineral will produce a distinct 6-rayed star due to light being reflected from the rutile needles. There are several minor ornamental stones of chatoyant quartz. Such quartz contains parallel fibrous mineral inclusions that exhibit wavy reflections as they are rotated in light (Hurlbut and Klein 1977). Rather than fibrous mineral inclusions, Koivula and Tannous (2004c) associate chatoyancy with “thin hollow tubes resulting from growth blockage (growth tubes) and/or post-growth dissolution features (etch tubes)”. Chatoyancy is also seen in Tiger’s Eye, a variety of cryptocrystalline quartz. Cryptocrystalline quartz includes many varieties of ordinary chalcedony as well as the extraordinary agate, carnelias, chrysoprase, onyx, sard, jasper, chert and flint that are so loved by lapidaries and rock hounds. Crystal Habit. Cryptocrystalline quartz crystallizes in the trigonal system and is separated into two types: (1) fibrous and (2) granular. These two may occur in the same deposit and grade into each other. Although the characteristics of each are often quite distinct, in many stones the differences are indistinguishable without the aid of a powerful microscope (Hurlbut and Switzer 1979). Chalcedony consists of microscopic fibrous quartz crystals with minute pore spaces that may be filled with water or air. The pore spaces may also contain minute particles of other minerals that produce that attractive coloring and banding in some agates (Sinkankas 1975). The granular type is made up of roughly equidimensional rather than fibrous microcrystals and includes jasper, flint, and chert (Hurlbut and Switzer 1979). The distinction between fibrous and granular cryptocrystalline quartz is not universally recognized and the two types are often lumped together as chalcedony (Schumann 1997). botryoidal habit. Photo by Wayne Sutherland. The most common granular varieties of cryptocrystalline quartz are flint (dark-brown to almost black due to impurities) and chert (commonly opaque light gray to white). The two grade into one another and both have dull luster. Although these were used extensively by early man for tools, today these have very limited use as a semi-precious gem. Jasper, also granular, is typically deep red, reddish-brown to yellow-orange due to the presence of traces of iron oxide within jasper. Jasper is almost opaque and has a dull luster (Hurlbut and Switzer 1979) and is commonly used as a low-value ornamental stone or lapidary semi-precious stone. Fibrous cryptocrystalline chalcedony commonly forms botryoidal masses with fibers oriented perpendicular to the hummocky surface. Chalcedony also occurs as cavity and void fillings or linings in various rock types. It is also found as fracture fillings and as replacements of organic material such as petrified wood. Wide variations in color, banding and patterns of inclusions are the source of the prolific names of sub-varieties of chalcedony (Hurlbut and Switzer 1979). Cleavage and fracture. Pure chalcedony has no cleavage and breaks with uneven rough to splintery, or conchoidal fracture similar to glass (Sinkankas 1959; Bauer 1968; Schumann 1997). Hardness. The hardness of chalcedony is typically listed as 7 on the relative Moh’s hardness scale. However, some sources such as Schumann (1997) indicate that its hardness will range from 6.5 to 7.0 and Bauer (1968) reports its hardness to be 6.5. Sinkankas (1959) explains that the hardness may appear to be lower depending on its porosity and purity as related to its fibrous structure. Specific gravity. The specific gravity of chalcedony is 2.58 to 2.64. This is slightly lower than coarsely crystalline quartz because of its slight porosity (Sinkankas 1959; Hurlbut and Switzer 1979). Size. Chalcedony can vary in size from small grains to large masses weighing tons. Color. Pure chalcedony is pale blue to white to pale gray, with other colors caused either by chemical impurities or by mineral inclusions (Sinkankas 1959; Schumann 1997). Fluorescence/Piezoelectricity. Chalcedony has no reported piezoelectric properties. Pure chalcedony is fluorescent blue to white, whereas fluorescence in other varieties ranges from nonexistent to strong yellow to blue-white depending on the presence of chemical impurities or mineral inclusions (Schumann 1997). Some of the popular Sweetwater moss agates from the Granite Mountains in central Wyoming fluoresce brilliant yellow due to presence of hydrous uranium arsenate (Hausel and Sutherland, 2000). Index of Refraction, transparency, pleochroism. The refractive index for cryptocrystalline quartz is about 1.53 (Hurlbut and Switzer, 1979). Sinkankas (1959) shows the refractive indices for chalcedony at 1.533 and 1.539, and Schumann (1997) states a range for pure chalcedony of 1.530 to 1.540, with a slight double refraction up to 0.004 with no dichroism. Pure chalcedony is translucent to transparent with a waxy to dull luster, but may vary to almost opaque with mineral inclusions (Sinkankas, 1975; Schumann, 1997). Chatoyancy. Chatoyancy is displayed in some varieties of chalcedony. Adularescence. Adularescence is rare in chalcedony. However, violet adularescent chalcedony is described in specimens that were found in Iran by Douman and Quinn (2004). Agate. Chalcedony nodules with banded colors (other than red, brown to yellow) are typically referred to as agates. The color bands tend to parallel the outsides of the nodules, or may form horizontal layers within the nodules. These derive from their formation as cavity linings and fillings in a variety of host rocks. The banding is usually distinct; however, common usage applies the name agate to varieties of chalcedony that also show no banding, such as moss agate (Sinkankas 1975). Thus, agate generally refers to the lighter-colored chalcedonies, whether banded or homogeneous. Youngite specimen from the Hartville area. banded agate – an agate that exhibits distinct color banding. fortification agate – an agate with banding that flows outward into several points within a nodule to provide the appearance similar to a medieval fortress. eye agate – an agate with concentric banding surrounding a point in the center that gives the appearance of an eye. agate breccia – an agate formed of broken broken lithic fragments that is rehealed by chalcedony and or quartz. moss agate - a translucent chalcedony that encloses moss-like manganese or iron oxide dendrites. botryoidal agate – agate that exhibits botryoidal texture. An external hummocky to rounded form similar to bunches of grapes. dendritic agate - moss agate that exhibits a distinct dendritic pattern. iris agate – an agate that exhibits a spectral display of colors due to microscopic diffraction grating caused by alternating bands of material that has higher and lower refractive indices. There are many other varieties of agates that are provided local names, such as youngite (pink to cream limestone breccia clasts rehealed with bluish-gray chalcedony and drusy quartz, from Hartville area, southeastern Wyoming) or the previously mentioned Sweetwater moss agates (Hausel and Sutherland, 2000). Others such as the Fairburn agate in South Dakota is a popular agate that is a banded agate. Bloodstone. Bloodstone is a green opaque chalcedony (or agate) with red spots. It is also known by the earlier Greek name, heliotrope (Mason and Berry 1968; Hurlbut and Klein 1977; Schumann 1997). Carnelian. Translucent red to orange-red and brownish-red chalcedony that is colored by hematite is known as carnelian. Carnelian grades into sard and is similar to jasper, in fact; many specimens of carnelian can be cut from many pieces of jasper (see jasper). According to Vanders and Kerr (1967), India is the principal source for carnelian, but other sources include Wyoming, Washington, Colorado and Michigan (Hausel, 2009). Chrysoprase. An apple-green to light-turquoise green chalcedony often colored by garnierite, a nickel silicate (Sinkankas, 1975). It is a secondary mineral that often forms in veins in nickel-rich host rocks such as serpentinite. Two localities in the US where chrysoprase has been identified include Riddle, Oregon and Tulare County, California (Hausel and Sutherland, 2006). ﻿﻿Onyx. Onyx is made up of alternating dark and light colored straight parallel bands or layers of chalcedony, usually black, white, red, and yellow. A similar appearing onyx is distinguished from onyx chalcedony which is known onyx marble. Onyx marble is considerably softer and easily scratched (Hausel, 1986; 2009). Some excellent onyx marble is found in the northern Hartville uplift of Wyoming (Hausel and Sutherland, 2000). Petrified wood. Petrified wood, also known as fossilized wood is produced by silica-rich solutions in groundwater replacing buried organic material. The silica-rich solutions are supersaturated in silica and slowly replace organic material in entire plants and trees with silica producing pseudomorphs of the plant that often contains extraordinary details of the original tree all the way down to cellular structure. Cryptocrystalline quartz of many types, including agate and jasper, may be found in petrified wood. Petrified wood is found on all continents with one of the most spectacular examples being the Petrified Forest National Monument and surrounding areas in northern Arizona where Triassic Shinarump and Chinle Formations contain numerous petrified wood tree trucks scattered all over the surface. Petrified wood is also known in the Eden Valley and Blue Forest areas of southwestern Wyoming, from the Wiggins Fork area in Absaroka Mountains of Wyoming, and from Yellowstone National Park in northwestern Wyoming. Sard. Sard is chalcedony that is primarily colored by goethite (hydrated iron oxide). It is gradational with carnelian and found in many jaspers. Sard is translucent to nearly opaque and occurs in brown, brownish-red, and brownish-yellow colors (Hurlbut and Switzer 1979; Schumann 1997). Tiger’s Eye. This agate expresses chatoyancy as a golden yellow color on a brown background. Depending on the background or base color, such agates receive various gemological and rock hound terms. When the background color is greenish-gray or green the gem may be known as cat’s eye quartz. When it is a blue-gray to blue, it is known as hawk’s eye quartz, and a stone with mahogany color base is called bull’s eye quartz. The chatoyancy is usually enhanced in rounded, polished, ornamental stones or cabochons. The chatoyancy in tiger’s eye is often cited as being caused by pseudomorphic replacement of asbestos-form minerals such as crocidolite (Hurlbut and Klein 1977; Cipriani and Borelli 1986). Heaney and Fischer (2003) proposed that ‘tiger’s eye’ is developed by a vein-filling process in which crocidolite asbestos fibers are cracked apart and resealed by overgrowths of columnar quartz. The quartz provides a relative hardness, and the crocidolite is responsible for the chatoyance found in tiger’s eye. Both processes may produce chatoyancy in different environments. Most tiger’s eye comes from South Africa although it also occurs in lesser deposits in California (USA), Australia, India, Myanmar, and Namibia (Schumann 1997). Primary Deposits. Quartz is a significant component of many igneous, metamorphic, and sedimentary rocks, as well as quartz veins, quartzites, and sandstones. The modes of formation for coarsely crystalline and cryptocrystalline quartz differ in general, but overlap under low temperature conditions. Coarsely crystalline quartz forms under both magmatic and hydrothermal conditions, but may also form by precipitation from silica-saturated, relatively low temperature hydrous fluids, which is the common mode for the formation for chalcedony. In other cases, desilication of country rocks followed by migration of silica in solution to dilational zones during regional metamorphism is also apparent in places. Quartz is one of the more common rock forming minerals and most quartz has little value as a gemstone, but is considered more as a semi-precious, lapidary, or ornamental stone. Some quartz, because of its crystal habit, color, transparency, or mineral inclusions, may have value as a semi-precious stone, or low-value secondary gem. The best quality macrocrystalline quartz varieties are faceted or kept as specimens, while lower-quality material is made into cabochons. Both coarsely crystalline quartz and chalcedony have been carved, although their brittleness generally negates the extremely delicate type of artwork found in the much tougher jadeite and nephrite. Cryptocrystalline quartz varieties are most often finished as cabochons. The translucent to transparent character of chalcedony combined with its moderate hardness, waxy luster, ability to take a polish, and its wide range of colors make it popular as a low-cost gemstone. Large amethyst crystals and other quartz gemstones are not common; one of the largest amethysts was 10 inches in diameter, and found in Thunder Bay Canada. A similar size amethyst was found in Maraba, Brazil. A cut amethyst in the possession of the British Museum of Natural History weighs 343 carats, and a large Brazilian faceted stone of 1,362 carats is located in the Smithsonian collection (Kievlenko 2003). Some enormous, well-formed common quartz crystals weighing up to 289 pounds have been found in the past (Mattana, Crespi and Liborio 1977) and an extraordinary quartz prism found in Mina Geris, Brazil, weighed more than 3,500 pounds (Anomalous 2003). Some of the more impressive, transparent, colorless quartz including some very large specimens have been recovered in Hot Springs County, Arkansas (US). Very large, well-formed translucent quartz and some large fluorite crystals were found in the Holy Moses pocket on the Godsend claim located in the Crystal Creek area near Lake George south of Denver, Colorado. The pegmatitic minerals were recovered from a miarolitic cavity in the Pikes Peak batholith. Some of the specimens included smoky and colorless quartz weighing up to 439 pounds (Berry and Fretterd 2003). Banded onyx agate enclosing geode with crystalline quartz. This discussion of deposits here must be considered as only a sampling of a voluminous subject due to the abundance of quartz-family gemstones and their wide-spread occurrences. As such, the focus is on amethyst for coarsely crystalline varieties, and on a few chalcedony occurrences, with emphasis on those from Wyoming. This does not negate the importance of other occurrences, merely a method of providing examples from a catalog that would otherwise run into thousands of pages. The finest amethysts are produced from Brazil, Uruguay, the United States, Madagascar, Russia, India, Australia and South Africa. Large quantities of citrine are found in Brazil, the United States, Spain and Russia. Rose quartz is mainly recovered from Brazil, the United States and Madagascar. Cat’s eye quartz is produced in Sri Lanka, Burma and Germany (Cipriani and Borelli 1986). South Africa has been an important source for hawk’s eye, tiger’s eye and bull’s eye quartz. Australia Some amethyst occurs in the northeastern portion of Queensland, in eastern New South Wales, and in the northeastern and central portions of Victoria. The amethyst from the Mount Phillips deposit 360 km northeast of Canarvon in Western Australia, occurs in a dike of nontronite-tremolite within migmatites and biotite schist xenoliths. The amethyst forms masses of druses weighing up to 50 kg, and some crystals weigh up to 5 kg. The stones typically have a dark violet color with small transparent zones that can be used for gemstones (Kievlenko 2003). Popular specimens of gold in quartz have also been produced from Australia (Laurs, 2005c). Bolivia Amethyst deposits in Bolivia are found in the Bolivian craton and are structurally controlled in zones of silicification developed along faults that cut Cambrian limestones. The better amethysts have dense, violet color and are extracted with citrine, as well as with colorless and smoky quartz crystals. A popular gem, known by the trade name ametrine, is zoned, bicolor quartz consisting of a mixture of amethyst and citrine. Some amethyst and quartz is also found in Proterozoic crystalline rocks in breccias and veins (Kievlenko 2003). Brazil. Brazil produces much of the world’s quartz gemstones and has done so since their discovery there in the 19th century. Brazil leads the world in it production of amethyst and other coarsely crystalline quartz varieties (Sinkankas, 1959; Bauer, 1968; Gübelin and Erni, 2000) including crystals with unusual inclusions (Hyrsl, 2004a). Brazil is also a major producer of agate, which often occurs within the same deposits as coarsely crystalline quartz. Hydrothermal amethyst is hosted by Proterozoic quartzite in the southern part of the State of Bahia in eastern Brazil. The fracture-filling veins include distinct veins, stockworks and cavernous fracture zones that are noted for their massive amethyst and euhedral crystals in cavities. Some veins have been traced for several hundred meters along strike and may exhibit widths of 2 to 3 m (6.4 to 9.6 feet). The Montezuma deposit is considered the largest of these. Obelisk and prismatic amethyst with transparent caps occur in crystal form up to 20 cm in length (8 inches). The amethyst is found in the veins with kaolinite-illite. 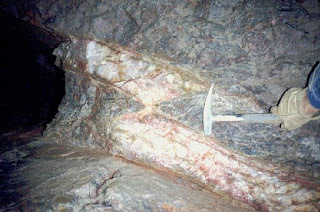 At the Fazenda Serra do Salto deposit, amethyst is related to a zone of fracturing in white to pink sericitic bearing quartzites. Rod-like greenish gray quartz with amethyst may be as much as 30 cm (12 inches) in length and may cement the breccia. Much of the amethyst is apparently heat-treated to produce yellow and orange-brown citrine under a trade name of ‘Rio Grande topaz’. At the Grogo do Choch deposit, amethyst is associated with stockworks and solution cavities in quartzite. The amethyst is found in radiating groups of crystals on the walls of fractures and ranges from to 3 to 30 cm (1.2 to 12 inches) in length, and is found in some geodes up to 1 m (3.2 feet) in diameter. Some scepter-terminated amethyst is also found at Grogo do Choch. The scepters sit on milky white to brownish red and translucent prisms. Well-formed, lustrous graphite cylinders, completely enclosed in quartz, have been found in rock crystal from Bahia. 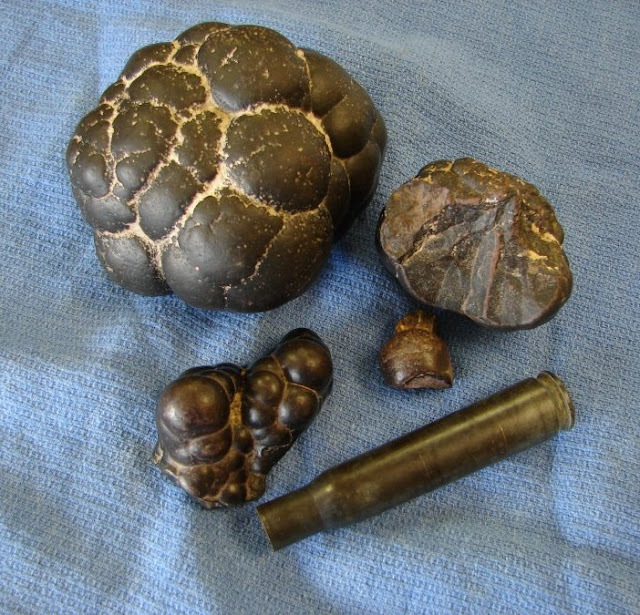 In rare specimens, the graphite is botryoidal. Doubly-terminated crystals up to 3 cm long are common, with some as much as 10 cm. Where the graphite extends to the crystal surface, it has either been replaced by yellowish-brown iron oxides or removed completely, with only a hollow cavity remaining (Hyrsl, 2004b). This is not really a photo of some quartz, but instead it is a strategically placed ad for one of my books. Exceptionally fine examples of rutilated quartz have been extracted from the Golconda mine in Minas Gerais (Koivula and Tannous, 2004e). Brazil has been known to have produced rutilated quartz with colors ranging from the more common golden-yellow to coppery-red and silver-gray (Koivula and Tannous, 2004a). Within the Parana River basin, abundant large amethyst geodes occur in tholeiitic basalts and basaltic andesites of the 40-50 m thick Lower Cretaceous Serra Geral Formation in the Ametista do Sul region in the state of Rio Grande do Sul. The volcanics occupy an area of about 1 million km2 and are as much as 800 m (2,500 feet) thick in some areas. Large portion of the basalts are mineralized over thicknesses of 2 to 10 m (6.4 to 32 feet). The amethyst, along with gray and colorless quartz, agate, celadonite, calcite and occasional barite, fills flat-lying joints in the amygdaloidal basalts and also cements local fracture zones. The locality in southern Brazil is well-known as a source of Palmeira amethyst (Schumann, 1997), including both faceting material and geodes. The color is lilac with a bluish tint and will turn brownish orange following heat treatment at temperatures of 435 to 475oC (Kievlenko 2003). in the Rattlesnake Hills gold district. Photo shows my field assistant - Wayne Sutherland (photo by the author). Crystals occur within spherical to vertically elongated geodes up to 6 m in size, that are layered with an outer coating of celadonite [K(Mg,Fe2+)(Fe3+,Al)(Si4O10)(OH)2 ] on top of agate. Inside the agate is found colorless quartz, which grades inward into amethyst. Calcite and gypsum may also be found within the geodes (Gilig and others, 2003). Using a variety of analysis techniques, including the study of fluid inclusions, Gilig and others (2003) hypothesized a two-stage process for the development of the geodes. First, fluid separation during magmatic cooling caused development of numerous cavities in the presence of lower density immiscible fluids within the basalt. This was followed by post-magmatic filling of the cavities at temperatures less than 100˚C by amethyst and other minerals. Crystallization of the geode-filling minerals was from a gas-poor circulating aqueous fluid that evolved from meteoric waters. This circulating fluid leached its mineral content from the highly-reactive interstitial glass indigenous to the basalt over a time that may have lasted for as much as 40 to 60 million years. At the important Maraba deposit in the western portion of the State of Para, 270 miles south of Belem, fractures in Proterozoic quartzites are filled with light-violet amethyst aggregates (Schumann, 1997; Kievlenko 2003). Canada Quartz-rich breccia zones along recurrent faults within an unconformity between Archean (2.7 Ga) and Proterozoic (2.0 Ga) rocks in the Thunder Bay – Lake Nipigon area of Canada are local exploration targets for amethyst. This 125 km long by 40 km wide amethyst region along the north shore of Lake Superior was the prehistoric source for amethyst used by native people. Modern mining there began in the 1860’s, but diminished in the early 1900’s with competition from material mined in Brazil. Renewed activity came in the 1950’s with the discovery of several large amethyst deposits. Amethyst occurrences in the Thunder Bay amethyst region are related to the hydrothermal vein system responsible for the Dorion lead-zinc-barite veins and Thunder Bay silver. Vugs and zoned veins within this environment host amethyst ranging in color from almost black to very pale-violet. Market strength for as many as 14 producers, many of whom offer fee-digging, is rooted in spectacular amethyst specimens often found in combination with barite and fluorite, as well as in fine facetable material (Garland, 2004). Snowy Range as well as in the Owl Creek Mountains of Wyoming. This amethyst field which includes the Thunder Bay, Diamond Willow, Dorion and Ontario gem mines lies along the northwestern coast of Lake Superior near Thunder Bay, Ontario. The amethyst is in barite-quartz veins that are up to 1.5 m (4.8 feet) thick. The veins occur in Late Archean granite gneiss, granite and quartz monzonite near the contact with Proterozoic sedimentary rocks. Veins, lenses and 15 to 25 m (48 to 80 feet) thick mineralized fractures are grouped in vein-stockwork zones that trend for 1.6 km (Thunder Bay) and 2.4 km (1-1.4 miles) (Diamond Willow). The amethyst was deposited on the walls of narrow fractures as radiating groups of fine crystals, compact aggregates, and large pyramidal shaped crystals up to 25 cm (10 in) in diameter that are found in clay-filled cavities in vein swells. These cavities may contain druse-like crystal aggregates in masses up to 300 kg. The color of the amethyst ranges form pale lavender to dense violet. The amethyst is interpreted to have deposited in iron-rich solutions that were depleted in aluminum under oxidizing conditions at 90 to 250oC and low pressures. The amethyst mineralizing event was preceded by quartz-barite-sulfide mineralization (Kievlenko 2003). Chile Transparent rock crystal with phantoms formed by thin, platy, lead-gray metallic molybdenite inclusions have been recovered from the Confianza mine, Tilama, Valparaiso. These well-formed, singly- and doubly-terminated crystals are reported to have weights in excess of 10 kg (Koivula and Tannous, 2004d). China Hydrocarbon inclusions within quartz are abundant in Sichuan Province, China (Hyrsl, 2004). Europe Amethyst is mined in the Rhodope Mountains of Bulgaria (Balitsky, Balitsky, Bondarenko, and Balitskaya, 2004). Iran Violet adularescent chalcedony has been mined from an area underlain by Eocene andesitic volcanic rocks near Qom Salt Lake in central Iran since 2003. The material is recovered as glauconite encased, irregular nodules that exhibit botryoidal structure and some agate-like color banding. The best adularescent chalcedony varies from dark-violet to light grayish-violet, and is accompanied by agate in colors of brown, orange, yellow, and pink. Production was reported in 2004 at 800 kg of chalcedony per month, with only about 150 kg exhibiting moderate tones of violet color. The translucent violet adularescent chalcedony, having a specific gravity of 2.59 and refractive index if 1.538, is processed into cabochons weighing up to 22.5 carats (Douman and Quinn, 2004). Madagascar Colorless rock crystal quartz from the Sakavalana pegmatite, Fianarantsoa Province hosted a pink-zoned inclusion of pezzottaite (a Cs, Li-rich member of the beryl group) (Koivula and Tannous, 2005). 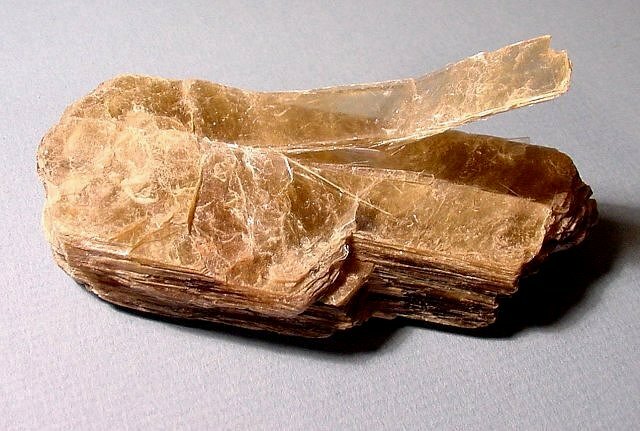 Chatoyancy resulting from coppery-red rutile within highly transparent quartz is one of many types of quartz that has come from Madagascar (Koivula and Tannous, 2004a). Namibia Amethyst and citrine are produced from the Sarusas mine in a remote part of Skeleton Coast Park in the Namibia Desert of northwestern Namibia. Amethyst and rare pale citrine occur as geodes within basalt. Quartz mined here during the late 1960’s through the mid-1980’s was entirely shipped to Germany. The mine was reopened in late 2004, producing about 1500 kg of rough from which less than 1% was facetable. Cut stones weighed up 20 carats, with amethyst colored light to dark purple, and citrine an orange-yellow to deep orange. Commercial citrine is produced through heat treatment of amethyst at as much as 600˚C (Laurs, 2005b). Pakistan Quartz crystals hosting both fluid and solid natural petroleum inclusions have been mined in Baluchistan (Koivula and Tannous, 2004b). Russia Amethyst deposits are found in the Ural Mountains and Yakutia. One hundred kilometers north of Ekaterinburg in the Murzinka-Adui region of the Central Ural Mountains, a large amethyst deposit is found along on a contact between Late Paleozoic Murzinka granite with Cambrian biotite-amphibolite gneiss. Topaz- and beryl-bearing miarolitic pegmatites occur in gneiss, while hydrothermal amethyst is mainly in granite west of the Murzinka and Sizikova villages. The principal amethyst deposit is the Vatikha in the Sizikovsky district. The district itself includes closely spaced quartz veins and mineralized fractures in granite. The quartz in the stockworks is associated with several faults that are mineralized along a 30 to 350 m (96 to 1120 feet) strike length. The veins range from 5 cm to 1 m (2 inch to 3.2 feet) thick and mineralization continues to depths of at least 150 m (480 feet) based on mining and drilling. The veins and stockworks are accompanied by intensely propylitized and argillized selvages that produce distinctly greenish altered granite. The walls of the fractures are coated with gray translucent quartz and the open veins contain some colorless and smoky quartz, amethyst and carbonates. The vein mineralogy also includes hematite, siderite, brookite, analcime along with secondary goethite, psilomelane and gypsum. Altered propylitized wall rock includes secondary kaolinite, sericite, chlorite, albite, carbonates, pyrite and quartz. Another group of amethyst deposits are found 80 km (48 miles) southwest of Aldan in southern Yakutia. The amethyst is found in syenite porphyries at their contact with granites. Where found, the amethyst occurs in hydrothermally altered granite and syenite porphyries that contain numerous fractures and quartz lenses associated with sericitization, kaolinization, and silicification. The main amethyst zone occurs in a fracture zone in syenite that was traced for 165 m (528 feet) along strike. The amethyst is found in cavities in swells and at the intersections of veins and fractures. The cavities reach up to 3 m (9.8 feet) in length with cavity walls covered by druses of smoky quartz and crystals of amethyst that are 1 to 8 cm long (0.4 to 2.4 inches). These occur primarily unattached to the walls, lying in the clay-sand material filling the cavities (Kievlenko 2003). Tajikistan The Selbur deposit in Tajikistan forms a large deposit of quartz with amethyst about 45 km (27 miles) west of Dushanbe in the Hissar Mountains. The deposit is part of a Middle-Upper Carboniferous volcano-sedimentary succession consisting of tuffaceous sandstones, siltstones, and limestones. The deposit consists of greenish-gray polymictic feldspar-quartz sandstones with sericite and chlorite that is cut by northerly trending fractures. These fractures zones exhibit silicification, potassic feldspathization, and locally some carbonatization and ferrugination, and contain numerous conjugate quartz-amethyst veins and lenses including a group of mineralized zones that are as much as 50 to 350 m (160 to 1120 feet) long and 1 to 8 m (3.2 to 25 feet) thick. The veins and lenses are essentially quartz veins with some ankerite and calcite. The quartz is primarily milky with gray comb-like translucent quartz and amethyst in the central portions of the veins. Cavities are periodically found in the central portions of the veins, with radiating quartz and amethyst crystals – some of the larger cavities also contain orange-red clay. Amethyst crystals have prismatic habit and typically do not exceed 5 cm (2 inches) in length. These for the most part are cloudy and fractured, and not suitable for gems. The gem material occurs in the comb-like portions of the vein. The amethyst ranges from pale to intense violet with a smoky to reddish tint. Near fracture zones, the sandstone is bleached and silicified and trapped xenoliths are intensively argillized. Other veins lacking in amethyst contain fine-grained sugary quartz and lack in alteration selvages (Kievlenko 2003). According to Kievlenko (2003) there are a number of small hydrothermal amethyst deposits in the US that are mainly found in the Appalachian Mountains in Virginia, North Carolina, South Carolina, and Maine. Other amethyst deposits are reported in Arizona and Montana. Arizona High-quality deep purple amethyst is produced from crystal-filled or crystal-lined cavities in the Four Peaks mine near the south end of the Mazatzal Mountains in Maricopa County, about 75 km (46 miles) northeast of Phoenix. Smoky and transparent quartz are produced here as well. This deposit, considered by some to be the most important commercial gem-quality amethyst source in the United States, has been mined intermittently since the early 1900’s. Rough crystals may be as large as 20 cm (8 inches) in diameter, but most are only clear enough near their tips to supply gems (Sinkankas, 1959). Cut stones have exceeded 20 carats in size, and show a wide range of purple colors including a very dark-purple and reddish-purple. Uneven color zoning with banding parallel to rhombohedral crystal faces, crystal faces coated or frosted with hematite and apatite, and variable transparencies in rough crystals are characteristic of the deposit. Finished stones may host hematite flakes and fluid inclusions, and may show growth zoning and Brazil-law twinning, all of which distinguish amethyst from the Four Peaks mine from synthetic material. Heat treatment is used on 20-30% of Four Peaks amethyst to lighten its overly-dark color, although subsequent fracturing renders about 50% of the treated material useless (Lowell and Koivula, 2004). The Superstition Mountains in Arizona - home of the Lost Dutchman Gold Legend. Most recently, the mine on a 20-acre patented mining claim within the Four Peaks Wilderness Area and at an elevation of 1981 m (6500 ft), has been owned and operated by Four Peaks Mining Company from Ocean Grove, New Jersey. The mine workings are limited to an open cut and a 10 m tunnel. Mining is accomplished using pneumatic and hand tools (Lowell and Koivula, 2004). The Four Peaks represent Precambrian metasediments that were intruded by Proterozoic granite. Development of linear zones of brecciation within the light-colored Mazatzal quartzite accompanied granite emplacement. Irregular cavities, generally 0.3 to 1.2 m (1- to 4-ft) deep and up to 3 m (10 ft) long, within the brecciated quartzite host amethyst as well as rock crystal and smoky quartz. These crystals are thought to originate from silica-rich hydrothermal fluids derived from the cooling of the intrusive granite (Lowell and Koivula, 2004). Cavities are often clay-filled, with quartz crystals either attached to the walls or loose within the clay. Detached crystals commonly show signs of extensive corrosion, probably related to late stages of cavity development. Apatite and hematite are common accessory minerals, and minute fluorapatite and hematite crystals are found as coatings on corroded and etched quartz (Sinkankas, 1959). Arkansas - Nearly flawless prismatic quartz is recovered from several deposits in Hot Springs County. The material exhibits excellent formed, transparent prisms terminated at one end by a pyramid. California - Striking specimens of gold-in-quartz have been produced from the Badger mine, Mariposa County, California. The mine was first worked in the 1850’s, producing $80,000 in gold from shallow tunnels and trenches in the Prescott quartz vein system. 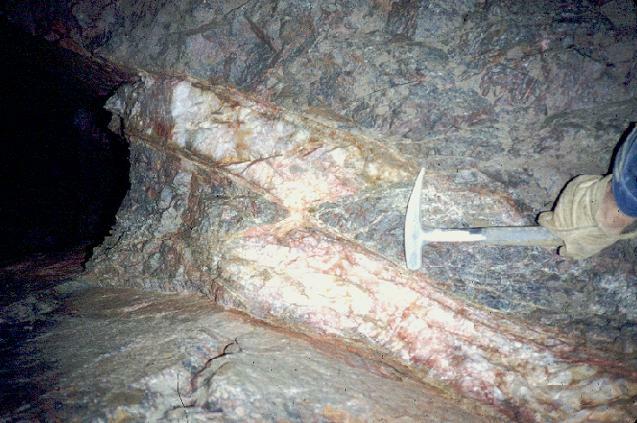 The vein is up to 10 m wide, and is prominent throughout the mining area. Gold-in-quartz is also produced from the Sixteen-to-One mine in Sierra County (Laurs, 2005c). Amethyst has been known for many years from the Kingston Range in San Bernardino County, California. Notable gem-quality material was recently extracted from the Purple Lily prospect, including crystals as much as 9 cm (3.5 in) in length. The amethyst occurs in cavities along northwest-trending fault zones and joints within granitic host rock. Amethyst crystals also are found within miarolitic cavities in areas of light-colored granite (Laurs, 2004). 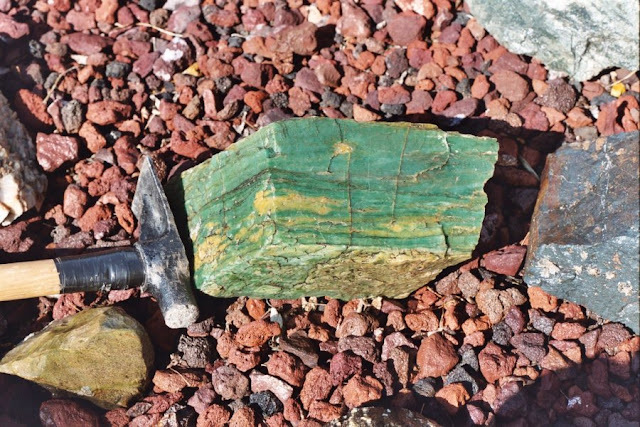 Naturally occurring green quartz or prasiolite is found on the California-Nevada border (Quinn, 2004). Quartz crystal in nephrite (jade) from the Granite Mountains, Wyoming. Colorado - Very large, well-formed translucent and smoky quartz crystals with some fluorite were found in the Holy Moses pocket on the Godsend claim located in the Crystal Creek area near Lake George south of Denver. The pegmatitic minerals were recovered from a miarolitic cavities in the Pikes Peak granitic batholith (1.02-1.08 Ga). The Pikes Peak granite forms the core of the Front Range of the Rocky Mountains in this region and includes numerous miarolitic pegmatites that have yielded exceptional specimens of smoky quartz, colorless quartz, topaz, microcline (including amazonite), goethite, albite and fluorite. The Lake George intrusive center of the Pikes Peak batholith is one of the more prolific sources for these pegmatites, and those found in the Crystal Creek area have been very productive in the past. The miarolitic cavities from this area typically are lense shaped – the largest being about 1.2 m (4 ft) high to 3 m (10 ft) long. However, recent exploration in this area led to the discovery of a series of cavities that have been excavated over a length of 13.5 to 15 m (45 to 50 ft) and widths of 1.8 to 3.2 m (6 to 10 ft). Crystals recovered from this cavity included a doubly-terminated smoky quartz crystal of 1.3 m (4.2 ft) in length weighing 235 lbs, another 1.2 m (4 ft) specimen weighing 439 pounds with translucent blue fluorite specimens up to 15 cm (6 inches) across (Berry and Fretterd 2003). Georgia - Amethyst crystals have been surface mined since the mid-1980’s from weathered granitic host rock near Jackson’s Crossroads in Wilks County, Georgia, about 150 km (93 miles) east of Atlanta. Recent mining, beginning in 2004, by Terry Ledford and Rodney Moore has produced cut stones larger than 48 carats that display a deep purple color in incandescent light and a noticeably more blue color in daylight. The site is open to public fee-digging (Laurs, 2005a). Montana - Amethyst is found in the Toll Mountain pegmatite in the southwest portion of Jefferson County near Butte. The miarolitic pegmatites are found in Mesozoic granite of the Boulder Batholith and are concentrated near granodiorite and quartz monzonite facies in the batholith. The principal deposits, referred to as the Pohndorf and Little Gem mines, were developed on three stock-like pegmatites. Amethyst is also reported in the East Range, Timber Butte, Lake Delmo and Goldflint Mountain areas (Kievlenko 2003). New York - Doubly-terminated quartz crystals from Herkimer County, New York have been known to host amorphous hydrocarbons as inclusions, referred to as “asphaltite” or “anthraxolite”. These originate within silicified dolomites, and appear to have developed during digenesis of the host rock (Hyrsl, 2004). Hydrocarbon inclusions are also known from other localities around the World, however, those from Herkimer are the best known. The small colorless quartz crystals from this deposit are widely known as ‘Herkimer diamonds’ (Hurlbut and Switzer, 1979). North Carolina - Coppery-red rutilated quartz has been mined from North Carolina (Koivula and Tannous, 2004a). 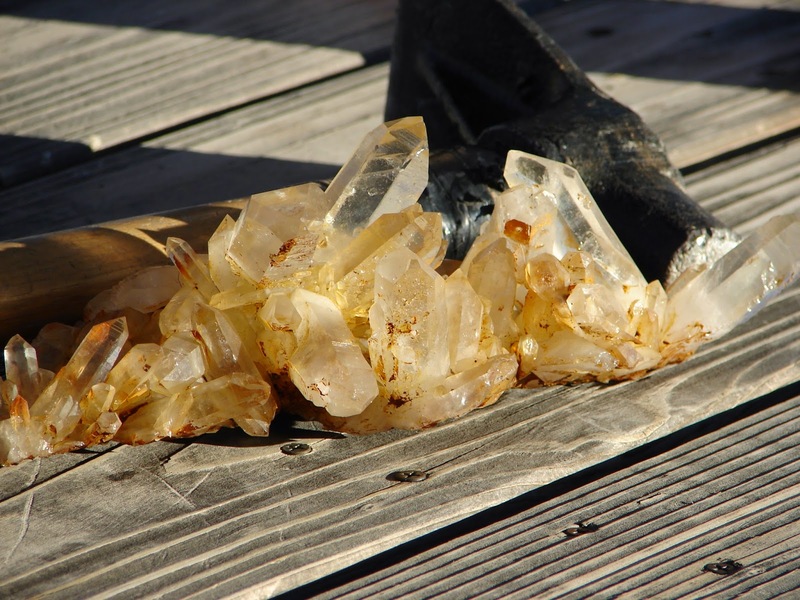 Wyoming - Many varieties of quartz and chalcedony have been found in Wyoming. Good specimens of prismatic quartz are uncommon in Wyoming, but the state has yielded many attractive specimens of chalcedony. Much of the crystalline quartz found in the state has been cloudy and translucent to opaque. 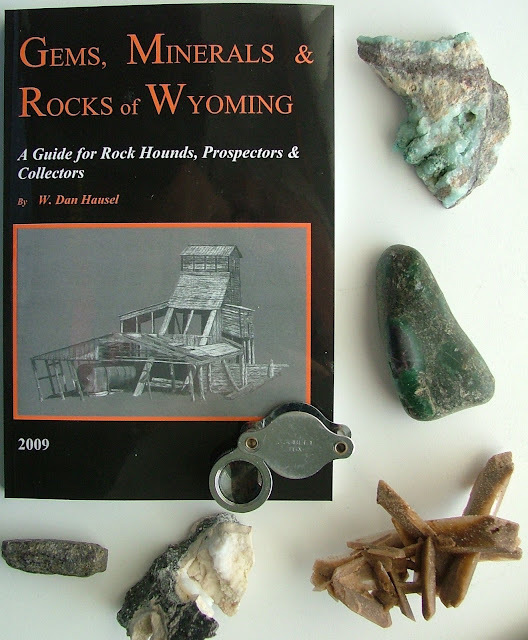 However, specimens of chalcedony are quite varied, and Wyoming has become a favorite collecting ground for agate, jasper, flint, and petrified wood. Malachite (green), azurite (blue) and limonite (tawny). Many different agates are found near Guernsey in the Hartville uplift of eastern Wyoming. These have attracted rock hounds and mineral collectors for years, and many varieties of agate have received local names. For example, one local agate known as Youngite, forms distinct rehealed limestone breccias consisting of pink- to cream-colored breccia clasts of Guernsey Limestone that are cemented by light-grey to greyish blue, banded, drusy quartz and chalcedony (Figure 3.43). The drusy quartz fills fractures in the breccia and completely encases the brecciated limestone clasts. When polished, the contrasting colors of the quartz and breccia clasts provide very attractive lapidary stones. Under long wavelength fluorescent light, these samples yield a blue network of fluorescence that follows the bands of drusy quartz. Samples of Youngite are of relatively high-value. Another popular agate found in the same region is the Slater agate. Slater agates form concretionary masses with white coatings. 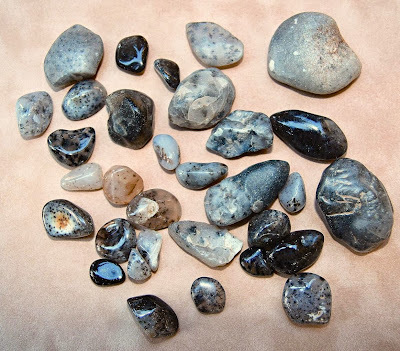 When cut, the interior of the stones are typically dark grey to black agate surrounding milky, agatized, interiors with small, fine, agatized dendrites. The surface of some of these agates is porous and may give an impression of a fossilized sponge. Petrified wood, quartz, and chalcedony are found in the Laramie, Sierra Madre and Seminoe Mountains, and in the Shirley, Laramie, Goshen Hole, and Saratoga Valleys in southeastern Wyoming. The most common forms of chalcedony in this region are agates and jaspers eroded from Paleozoic limestones, particularly, the Casper Formation. Some petrified woods from this region are probably derived from silica leached from Tertiary volcanic ash falls, that later replaced the wood. In the Saratoga Valley, agatized and opalized woods and dendritic agates are found on the flats north of town. The host rock was possibly tuffaceous sandstone, siltstone, and claystone of the North Park Formation. Beautiful specimens of jasperized iron formation are found in the Seminoe Mountains several miles northwest of Saratoga, and north of Sinclair. These rocks are magnetic and have alternating bands of black magnetite, dark gray quartz, and tawny to brown layers of jasper and grunerite. The source of this material is banded iron formation from Bradley Peak in the Seminoe Mountains gold district. Much of the jasperized material is found as cobbles and pebbles downstream along Deeweese Creek and in alluvium along the north flank of the range near the Miracle Mile on the North Platte River. This area should also be of interest to the gold prospector. The Miracle Mile is surrounded by a dry placer formed of unconsolidated gravels located several feet above the river banks. The authors have recovered gold colors from badger and other burrowing animal diggings in this region. They have also found diamond stability pyrope garnets associated with pediment gravels in the same area. At Shirley Basin east of the Seminoe Mountains, several agates and jaspers have originated from Casper Formation limestones and sandstones. One agate is a reddish-brown jasper mixed with dark gray to black opaque agatized breccia near Mine Hills and Crystal Hill to the south of Marshall. This rock consists of pink breccia clasts of Casper Formation sandstone cemented with reddish-brown and massive black chert coated with tiny grains of psilomelane (metallic, manganese oxide) that produces an attractive decorative stone. Along the southern end of the basin, the Shirley uplift is famous for silicified dinosaur bones found on both sides of Como Bluff north of US Highway 287/30 near Medicine Bow (Sinkankas, 1959). Near Battle Lake in the Sierra Madre Mountains southwest of Saratoga, quartz crystals occur in cavities and fractures in red granite. The quartz includes amethyst, rose, smoky, milky white, and clear quartz crystals. Most are small and less than 2 inches in length. This region is also known for its old copper mines and several significant gold, platinum, palladium, nickel, and zinc anomalies. The Absaroka Mountains in northwestern Wyoming, have produced a variety of petrified woods and agates. Along the western margin of the range, Yellowstone Park is famous for its fossil forests at Specimen Ridge and Amethyst Mountain. Some prostrate fossilized trunks have been found in this region that are more than 50 feet long, and 5 feet in diameter (Sinkankas, 1959). Amethyst is also reported in the Yellowstone area at Amethyst Mountain (keep in mind, collecting is prohibited in the National Park). Wood casts, fossil cone casts, agatized seeds, and oval nodules have also been found in this region. These are clear, gray, brown, yellow, green, and red with patterns that include fortifications, banding, spots, moss, tea leaf, and iris agate. Wiggins Fork agates, petrified wood, and Montana agates are also found along the Yellowstone River as far east as Glendive, Montana. East of the Absaroka Mountains, chert, agate, and jasper occur in Paleozoic limestones along the eastern flank of the Bighorn Basin, along the southern margin of the Bighorn Mountains, and the north side of the Owl Creek Mountains. Woodcast agates are reported along the Bighorn River and in several drainages on the western margin of the basin. Green agates and crystal-lined geodes have also been reported along Cottonwood Creek near Hamilton Dome. from a kimberlite in Wyoming - note the two large pyrope garnets on the side. A colorful red and white banded fortification agate, known as the Dryhead, weathers out of the Phosphoria Formation in the northern Bighorn Basin. This agate is named for the barren Dryhead country, which form the cliffs along the Bighorn River north of the Wyoming-Montana state line. In the Wind River Basin to the south of the Owl Creek Mountains, rainbow agates are found along the Wind River near Riverton. In the Black Hills of northeastern Wyoming, some chalcedony and amethyst is found. Agates and jasperoids are also reported in stream gravels along with gold colors and nuggets in the Mineral Hill district of the Black Buttes east of Sundance. These appear to be related to Tertiary alkalic volcanic rocks. In the Powder River Basin, west and south of the Black Hills, several varieties of petrified wood, chert and jasper are found. The chert and jasper are associated with Paleozoic limestones along the western margin of the basin, and the petrified wood is derived from the Wasatch Formation. Occasionally, some spectacular, large-diameter stumps and logs are found. East of Buffalo at the Dry Creek Petrified Tree site, poorly silicified, brittle, wood is found that easily crumbles into small pieces. The petrified wood in this area is primarily of scientific interest and is not suitable for polishing. Yep, another strategically placed book ad. The Granite Mountains in central Wyoming are known for jade. 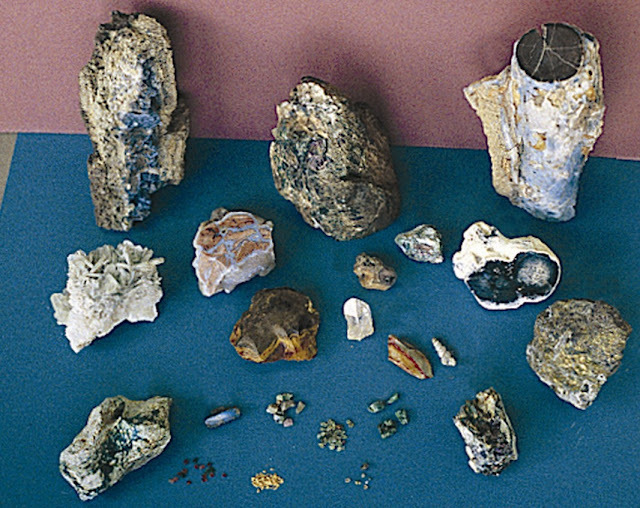 In addition, several types of agate, jasper, and petrified wood and some rubies and sapphires have been found. One of the better-known varieties of agate is the Sweetwater moss agate which usually occurs as small pebbles in lag gravel and in the basal conglomeratic sandstone of the Split Rock Formation. These agates fluoresce brilliant yellow due to the presence of hydrous uranium arsenate. They often contain a brown, opaque surface that can be removed by tumbling. Tumbling results in a highly polished, light gray to blue agate with black manganese dendrites. In the same general region, the Ice Point Conglomerate, has rounded fragments of black petrified wood, and the Bridger Formation contains fossil tree stumps, fragments of petrified wood, and dark gray and brown agates (Love, 1970). Some clear chalcedony balls have also been found, that are coated with opal and white ash. These have loosely been termed 'moonstones'. Another popular agate, the 'Angel' agate, is found in a 6 inch zone in the upper porous sandstone of the Split Rock Formation. The agate occurs in nodules and is an attractive pale-greenish-gray color with a chalky-white surface coating. The agates fluoresce a brilliant greenish-yellow under ultraviolet light, and are slightly radioactive (Love, 1970). In the nearby Tin Cup district, beautiful jasperized breccias with angular fragments of blood-red, chocolate-brown, and butterscotch yellow-brown jasper occur along three prominent faults which were prospected for gold in past years. Some attractive chalcedony in this area is gray, banded, folded agate. In the Eden Valley in southwestern Wyoming, petrified wood is found over a wide area around Farson. This wood resembles ordinary weathered wood and has an opaque cream colored coating of silica covering a silicified black to brown core. The Laney Shale Member of the Green River Formation and the overlying Bridger Formation appear to be the source of this material. Locally the Bridger Formation contains petrified wood near Oregon Buttes. This wood, known as the Bridger-type, consists of partially silicified black wood. Where it is completely replaced by silica, it ranges in color from brown, tan to green. Some clear chalcedony and vein moss agates are found nearby, as well as paleoplacer gold. Some of the more striking wood found in Wyoming is Blue Forest agate west of Farson in the Eden Valley. The wood has a black to brown central core surrounded by clear blue chalcedony which producing an unique and very attractive, silicified wood. Reefs and beds of silicified gastropods (fossil snails), which were deposited in a prehistoric lake, are found throughout the area. 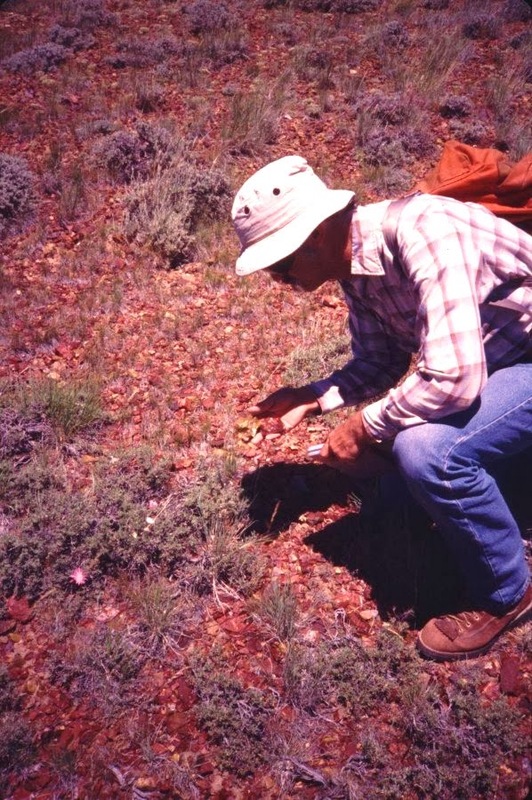 Some of the better collecting localities occur along Delany Rim south of Interstate 80 near Red Desert west of Rawlins, and to the west of Rock Springs. Some fossil snails are light-brown in color and have a weathered appearance, and will not polish. The darker agates found in shades of dark brown to black, will generally polish, and produce attractive bookends. springs. Some of these will produce beautiful lapidary stones (Hausel and Sutherland, 1998). Uruguay Uruguay produces amethyst and other quartz gems, including agate, from deposits similar to those found in its neighbor, Brazil. Zambia Hydrothermal amethyst mineralization in Zambia is related to boundary faults that separate basement Mesoproterozoic gneisses and metasediments that are intruded by Late Proterozoic granitoids from Mississippian-Late Triassic Karoo rocks. Amethyst deposits are contained in veins and stockworks along these faults that occur within the basement complex at many places in Zambia. The most important production comes from the Southern Province in the Mwakambiko Hills and in the Mumbwa-Namwala area, adjacent to Lake Kariba near the boundary with Zimbabwe (Kievlenko, 2003). Amethyst production from Zambia amounts to about 700 tonnes per year, with the largest amount coming from Mwakambiko. The Mwakambiko deposit is hosted in granosyenite that has intruded hornblende gneiss, quartzites, and marbles. Abundant quartz-amethyst veins and lenses up to 1 m (3.3 feet) thick cut the brecciated, silicified, and hematite-enriched host rock in a northerly trend for 3.5 km (2.2 mi). Amethyst from the Mwakambiko deposit is extracted primarily from eluvial debris Kievlenko (2003). Hausel, W.D., and Sutherland, W.M., 2006, World Gemstones: Geology, Mineralogy, Gemology & Exploration: WSGS Mineral Rept MR06-1, 363 p.